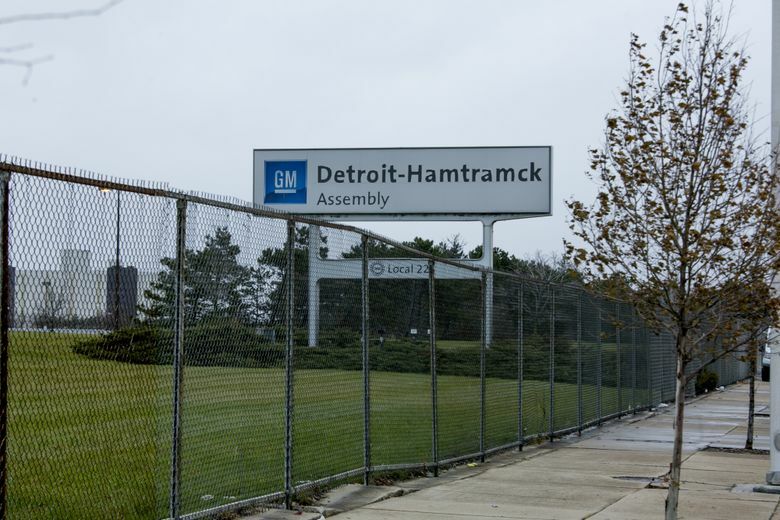 Signage at the General Motors Detroit-Hamtramck assembly plant in Detroit on Nov. 26, 2018. (Anthony Lanzilote/Bloomberg). In late spring of 1981, Detroit's Poletown neighborhood, a working-class grid on the city's northern lip known as a hub for Polish immigrants and culture, had been reduced to a literal battlefield. The once-proud neighborhood was a skeletal wreck. Many of the residents had already bolted, pockets stuffed with fat payouts from the city. Their houses had since been pancaked by wrecking balls. The structures still standing were being picked clean by looters or eaten away by arson. In late spring of 1981, Detroit’s Poletown neighborhood, a working-class grid on the city’s northern lip known as a hub for Polish immigrants and culture, had been reduced to a literal battlefield. The cause for the deterioration was municipal progress. Auto giant General Motors wanted Poletown’s 465-acres for a brand-new plant straddling the line between Detroit and the nearby town of Hamtramck. Detroit Mayor Coleman Young Jr. was on board, offering to use a new eminent domain law to grab the 1,500 homes and hundreds of businesses. The auto unions were also game. Even the city’s Catholic Archdiocese supported the project, offering to sell off Immaculate Conception Church, the neighborhood parish where mass was still conducted in English and Polish. But the neighbors were not having it. Led by Rev. Joseph Karasiewicz, Immaculate Conception’s quiet and humble priest, a loose coalition battled the plant that spring. Defying his own cardinal, Karasiewicz and his allies worked day and night from metal desks in the church basement, searching for a way to save Poletown. The proposal for the new plant in the early ’80s came as Detroit was starting to slip from the heights of its postwar manufacturing power. As The Detroit News recounted in 2000, by 1980 auto plants were beginning to close in the region. The GM plant on the Poletown area was designed to replace an aging Cadillac factory, and the proposal would keep 6,000 jobs within the city limits. It would be GM’s first new factory construction in Motor City in decades. Poletown was also beginning to feel seismic shifts. Originally settled by Polish immigrants in the 1870s, the neighborhood exploded in the 1920s and 1930s with Polish workers who arrived to labor in Detroit’s auto factories. By the 1980s, the original Polish population was grayer and dwindling, and the neighborhood was also now home to a mix of Albanians, Slavs, Filipinos and African Americans, the News reported. When Detroit first offered residents a buyout for the GM project, many jumped at the opportunity to relocate to nicer suburbs outside the city. As The Post reported in 1981, the city paid as much as $12,000 for older homes ($34,289 in today’s currency), with an added $15,000 ($42,861 today) relocation fee. But the unwilling did not have much choice: under the eminent domain law, they were forced to sell. In total, the project threatened to uproot more than 4,000 people. The David-versus-Goliath spectacle drew a colorful assortment of players. John Saber, a retired photographer who had lived in his home for 46 years, refused the city’s offer of $15,000 for his property, the News reported. Instead, he began building a wall around his house and patrolled the front yard at all times with a .22 caliber rifle to scare off looters. He eventually sued the city for $15 million. “Acting as his own lawyer, he claimed damages for, among other things, destruction of a miraculous apparition on his window sill, his ‘prize’ cats being eaten by dogs abandoned by departing neighbors and an art studio that he would have built on the empty lot next door,” the News wrote. The standoff also popped up on the radar of Ralph Nader, the crusading lawyer who had gone head-to-head with auto manufacturers like GM over product safety. As James T. Bennett documented in his book “Corporate Welfare: Crony Capitalism That Enriches the Rich,” Nader dispatched volunteers and lawyers to Detroit to help the neighbors in their various legal challenges. He saw the proposal as an example of the vampire capitalism bleeding American communities dry. “Now, even the wealthiest multinational corporations such as General Motors prepare a prospectus for building a plant and then dangle it before various municipalities and states to ascertain how large a subsidy the taxpayers will be compelled to provide if they want the plant in their area,” Nader wrote at the time. But Immaculate Conception’s Rev. Karasiewicz was very much the public face of the fight. A 59-year-old Detroit native and son of a Ford Motor Company janitor, the priest openly expressed outrage when his devoted flock was booted from their hard-earned place. Poletown was effectively done, but Immaculate Conception would be the site of the neighborhood’s last stand. Church authorities told Karasiewicz the congregation’s final mass would happen May 10, 1981. According to Bennett’s book, 1,500 worshippers filled the pews. Karasiewicz was ordered to leave the property by June 17. He obeyed, but refused to hand over the church records, The Post reported. A number of holdouts remained inside Immaculate Conception after the priest vacated, occupying Poletown’s last standing touchstone as a final act of defiance. The sit-in lasted for 29 days. Immaculate Conception was brought down soon after, and construction on the GM plant began. Sader, the gun-totting holdout, was forcibly evicted in March 1982. The facility’s first car — a Cadillac Eldorado — sailed off the assembly line at 12:05 p.m. on Feb. 4, 1985. In the ensuing decades, the plant’s fortunes rose and fell with the American auto industry, a cumulative long slide that continued with Monday’s dark announcement.